Saddam Hussein was hanged in Baghdad at dawn on Dec. 30, 2006. Read the report and watch the video here. Saddam Hussein remained in American custody Friday morning, pending his handover to Iraqi authorities for execution, his chief defense attorney and a top Iraqi official said. The lawyer, Khalil al-Dulaimi, said American officials had called him and asked him to authorize someone to receive Saddam's personal belongings from the U.S. military prison where the ousted Iraqi leader is being held. Al-Dulaimi said he had not yet done that. But he said, "This call means that they will hand him to the Iraqi authorities soon." A U.S. military officer told CBS News Thursday that Saddam Hussein would be turned over to the Iraqi government within the next 36 hours. CBS News national security correspondent David Martin reports the officer expects that the Iraqis will execute their former leader before the start of the Eid religious holiday on Sunday. Al-Dulaimi, speaking from Amman, Jordan, said he could not say when the handover will be, or when Saddam's expected execution will happen. Al-Dulaimi warned that turning over Saddam to the Iraqis would increase the sectarian violence that already is tearing the country apart. "If the American administration insists in handing the president to the Iraqis, it would commit a great strategic mistake which would lead to the escalation of the violence in Iraq and the eruption of a destructive civil war," he said. Issam Ghazzawi, another member of Saddam's defense team, said there was no way of knowing when Saddam's execution would take place. "The only person who can predict the execution of the president ... is God and Bush," Ghazzawi said on Thursday. Saddam is being held at the American military prison known as Camp Cropper. U.S. and Iraqi authorities have said he must be handed over to Iraqi officials prior to his execution. "Press reports that he has been handed over are not correct," Bosho Ibrahim, Iraq's deputy justice minister, said late Friday morning local time. Armand Cucciniello, a spokesman for the U.S. Embassy in Baghdad, said he could not say whether Saddam had been transferred to Iraqi authorities. "It's up to the government of Iraq to carry out the execution," Cucciniello said. National Security adviser Mouffak al Rubaie said fear of reprisals by Saddam loyalists has kept the date of the execution secret, he strongly indicated to CBS News that Saddam's execution is imminent. "I think the sooner the better," al Rubaie told CBS News correspondent Randall Pinkston. Whenever it occurs, Saddam's execution is likely to cause an uproar across the Arab world. "It will be a huge shock to the people in the Arab world," Abdel-Bari Atwan, editor of the London-based Arab newspaper Al-Quds Al Arabi, told CBS' The Early Show. "I think people will be shocked and dismayed by this execution. On Tuesday, an Iraqi appeals court upheld Saddam's death sentence for the killing of 148 people who were detained after an attempt to assassinate him in the northern Iraqi city of Dujail in 1982. The court said the former president should be hanged within 30 days. Thursday, Saddam's chief lawyer urged the United States not to hand the ousted leader over to Iraqi authorities before his expected execution because he is a "war prisoner." Al-Dulaimi called on international and legal organizations, including the Arab League and United Nations, to "rapidly prevent" the Americans from handing Saddam to the Iraqis. "According to the international conventions it is forbidden to hand a prisoner of war to his adversary," he told The Associated Press in a telephone interview. Pinkston reported Iraqis, members of the coalition and international representatives will witness the execution. 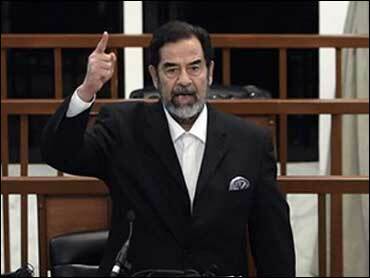 Iraqi officials have said that Saddam's final moments will be videotaped by the government. "We will video everything," al Rubaie said. "All documentation will be videoed. Taking him from his cell to the execution is going to be videoed, and the actual execution will be documented and videoed." It's not clear whether the videotape will be broadcast on Iraqi television. An Iraqi government official says efforts are under way to carry out the death sentence by the end of this month, indicating that they want to do the execution before Eid, which coincides with the New Year. A top government official disputed the court's ruling that Saddam must be hanged within 30 days, saying the execution should be held after that time period. The comment comes amid debate over other legal procedures such as whether the presidency is required to approve the execution. "The law does not say within 30 days, it says after the lapse of 30 days," said Busho Ibrahim, deputy justice minister. There was no immediate explanation for the conflicting claims. In a farewell letter posted on the Internet Wednesday, Saddam urged Iraqis to embrace "brotherly coexistence" and not to hate the U.S.-led troops. "I call on you not to hate because hate does not leave space for a person to be fair and it makes you blind and closes all doors of thinking," said the letter. Saddam is in the midst of another trial, one in which he's charged with genocide and other crimes during a 1987-88 military crackdown on Kurds in northern Iraq. An estimated 180,000 Kurds died during the operation. That trial was adjourned until Jan. 8, and experts have said the trial of Saddam's co-defendants is likely to continue even if he is executed. Human Rights Watch, an international watchdog group, says Saddam was certainly a human rights violator, but Iraq's government shouldn't execute him. "The true test of respect for human rights comes when the human rights of someone who has violated in unspeakable ways the human rights of many millions of people comes into play," said the group's Richard Dicker. A suicide bomber killed nine civilians north of Baghdad on Friday afternoon, police said. At least a dozen people were also injured when the bomber detonated his explosives belt in Khalis, 50 miles north of the Iraqi capital, police said. Two Iranian diplomats detained by U.S. troops in Iraq were released early Friday in Baghdad, Iran's state-run television and news agency reported. The Iranians were in Iraq on the invitation of Iraqi President Jalal Talabani, officials have said. Their detention was announced on Monday. The U.S. military announced five more American troop deaths: four soldiers hit by roadside bombs on patrol and a Marine killed in combat in volatile western Iraq. That raises U.S. troop deaths this month to 100. As of Thursday, Dec. 28, 2006, at least 2,991 members of the U.S. military have died since the beginning of the Iraq war in March 2003, according to an Associated Press count. The British military has reported 126 deaths; Italy, 33; Ukraine, 18; Poland, 18; Bulgaria, 13; Spain, 11; Denmark, six; El Salvador, five; Slovakia, four; Latvia, three; Estonia, Netherlands, Thailand, two each; and Australia, Hungary, Kazakhstan, Romania, one death each. In search of a new U.S. strategy on Iraq, President Bush met at his ranch Thursday morning with his top national security advisers. Afterwards, he said he's making good progress in coming up with a new plan for Iraq, reports CBS News White House correspondent Mark Knoller. In a 2004 interview embargoed for release after his death, former president Gerald Ford told the Washington Post the war in Iraq was unjustified and that he very strongly disagreed with President Bush's reasons for attacking Iraq.